Before I focused on cycling, I did all sports. I tried everything, and the last sport I did was cycling—and it was the thing I was best at. My father was also a cyclist, as was my grandfather who was world champion. Greatest racing memory: When I won Paris-Roubaix juniors in 2009. Guillaume Van Keirsbulck’s experience far exceeds his age. The 27-year-old made his WorldTour debut in 2011 at the young age of 19. 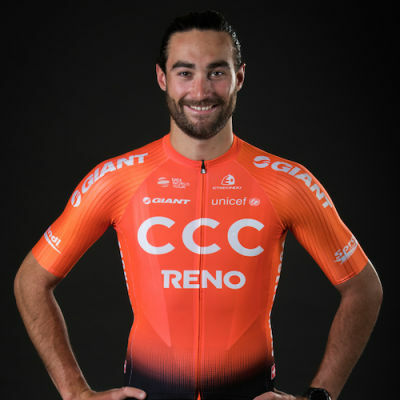 The Belgian joins CCC Team this year as a key member of the classics squad, riding in support of Greg Van Avermaet. With a stage win at Binck Bank Tour in 2014, and victory at Le Samyn in 2017, Van Keirsbulck has proven that he feels at home on the pavé. Beyond that, he has raced 12 monuments as well as the Tour de France (twice) and the Vuelta a España.